Restaurant Chef Aprons and Server aprons from Arden Benhar, Atlantic Mills, BVT Chef Revival, and Handgards are top of the line and durable. Bib pocket aprons are the most popular aprons in foodservice. Chefs always have their hands full and need pockets to store utensils, notepads, smallwares, ingredients, and more. Chefs also need heavy duty aprons but need good venting to keep them cool in the hot kitchen. Aprons protect your clothing from spills and the right apron can help you remain cool and comfortable throughout the day as well. 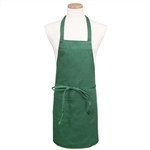 Buy your wholesale aprons from the restaurant supply superstore. Boyd Polyethylene Disposable Aprons 28 in. x 46 in. Boyd Polyethylene Disposable Aprons 24 in. x 42 in. Handgards Medium Duty Poly Apron Clear - 28 in. x 46 in. Handgards Apron White - 28 in. x 46 in. 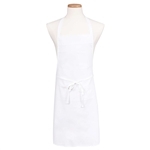 Handgards Embossed Apron White - 24 in. x 42 in. Handgards Apron White 28 in. x 46 in. Handgards Apron Clear - 28 in. x 46 in. Handgards Medium Duty Apron White - 28 in. x 46 in. Handgards Valugard Poly Apron White - 28 in. x 46 in. Vinyl Dishwashing Clear Apron - 36 in. x 45 in. NeatGards Light Duty Poly Embossed White Apron - 28 in. x 46 in. NeatGards Heavy Duty Poly Smooth White Apron - 28 in. x 46 in. 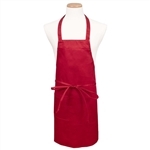 Red Vinyl Apron - 31 in. x 39 in. 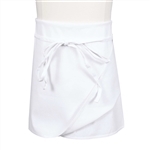 White 6 Mil Vinyl Apron - 31 in. x 39 in. Hycar Black Neck Cloth Apron - 36 in. x 48 in. White Plain Bib Treated Apron - 27.5 in. x 31.5 in. Blue Vinyl Apron - 31 in. x 39 in. 1.77 Mil Poly Apron - 28 in. x 46 in. Buy your restaurant supply commercial aprons from the leader in foodservice supply for not only your kitchen staff, but waiters, waitresses and bus boys as well. Aprons protect your clothing from spills and the right apron can help you remain cool and comfortable throughout the day as well. 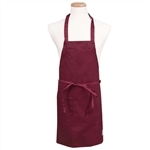 Buy your wholesale aprons from the restaurant supply superstore and rest assured that you will be comfortable and protected throughout the busy work day.